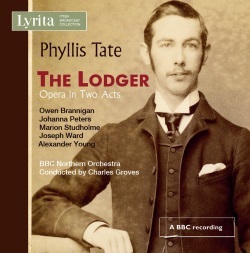 The case of Phyllis Tate’s opera The Lodger is a rather curious one. When it was originally performed in 1960 at the Royal Academy of Music it received a pretty well universal chorus of approbation from the critics. The redoubtable Harold Rosenthal went so far as to describe it as the best first opera from a composer since Peter Grimes - thus rating it above Tippett’s The Midsummer Marriage and Walton’s Troilus and Cressida. The cast at the original performance included David Bowman, Jean Evans, William McCue and John Wakefield. Four years later this BBC broadcast was furnished with singers from the first rank of current British performers. A professional performance by the New Opera Society followed in 1965, and then a production by the Royal Northern College of Music in 1970. Since then, nothing. Paul Conway’s extensive booklet notes with this issue do not seek to explain this neglect, and indeed it does seem fairly inexplicable except in terms of the unwillingness of opera companies to explore paths off the straight and narrow during the 1970s when financial constraints were if anything more severe than they are now. The score never seems to have been commercially published – it remains available on hire from OUP – and this BBC recording has not so far as I am aware ever been pirated or otherwise issued even on the internet. Which makes this private recording by Richard Itter doubly valuable, especially when Lyrita have provided not only a booklet packed with background information on the composer and the opera itself, but also a second booklet containing the complete text of the opera as performed here. The plot itself is not altogether enticing. Based on a book by Hilaire Belloc’s sister Marie, it tells the story of a poverty-stricken couple who are happy to let out a room to a well-spoken lodger who eventually turns out to be Jack the Ripper. The legend of the Victorian series of murders in the East End of London has inspired much speculation over the years, of which the most intriguing and controversial theory attempts to identify the killer as the current Queen’s grand-uncle; but hard facts are hard to come by, and the unsolved crimes continue to exercise writers to this day. The Lodger does not attempt to make any identification of the killer, but portrays him as a conscience-haunted and indeed tragic figure whose attempts to find religious consolation are doomed to failure. The central character is the wife of the landlord, whose suspicions are aroused from the first but who fails to act on them – in the first instance out of sheer financial need of the rent the killer provides, and then out of a sense of pity for him. The libretto was constructed by David Franklin, a singer of some note in the 1930s and 1940s – he can be heard as the Commendatore in the Glyndebourne pre-war set of Don Giovanni – who then went on the establish a career as a broadcaster. He therefore could be expected to understand precisely what words would and would not work in terms of operatic dialogue. The results here are rather plain and don’t pack much of an emotional or poetic punch; obviously this was what the composer sought, but some of the lyrical passages could have done with richer imagery. By the time of the first professional performance in 1965 the critical reception appears to have cooled. Noël Goodwin in Opera magazine complained that the music “remains obstinately two-dimensional” and that “it remains entrenched in a conventional idiom that cosily muffles incident and emotion instead of projecting it.” Oddly enough, at this time the same Harold Rosenthal who had been so enthusiastic about the opera five years earlier was the editor of the magazine in question. At all events, this valuable release gives us an opportunity to give further consideration to the merits of the score. Unfortunately it proves to be the case, at any rate at this later date, that judgement on The Lodger comes closer to Noël Goodwin’s estimation than Harold Rosenthal’s. The obstinately prosaic language of the libretto seems to strike little spark in Phyllis Tate’s music, which conscientiously sets the text without adding much in the way of illumination either dramatic or emotional. She seems happiest in the concerted passages, most notably a superbly constructed finale to Act One (CD1, track 8) which rises to musical heights which serve only to make the listener realise what is missing elsewhere. The closing scene of Act Two is similarly inspired. The Cockney chorus which launches the second scene (CD1, track 5) with its honky-tonk piano comes quite close in tone to Lionel Bart’s Oliver! – launched upon the London stage at about the same time as The Lodger – but its further development into a sinister backdrop produces an excellent dramatic effect. This is however somewhat undermined by the obstinately one-dimensional nature of the studio production, which seems to bring passages of offstage music right in front of the microphone. Mind you, part of this is the result of a clear misjudgement on the composer’s part. “From down the road, they can hear the cockney party still celebrating”, the narrator tells us; but the orchestral scoring to accompany this choral passage is so raucous that if the singers were placed at the distance one would expect they are unlikely to be heard at all. The composer made some alterations and adaptations to the score for this broadcast, and one wonders whether this passage would ever have worked in the theatre. Other additions include the role of a narrator, placed very close to the microphone. This was standard practice at the BBC during this period, and obviously helped the listener at home to follow the plot; but with the complete text in front of us in this set, the effect is decidedly supernumerary. The adoption by the solo singers of East End accents on the occasional phrase, again clearly inserted for dramatic effect, sounds very much like an applied idiom which simply sounds condescending – the same sort of problem that Eliza Doolittles encounter in the opening scenes of Shaw’s Pygmalion – and this is unavoidable. The diction of the singers is however absolutely perfect, partly the result of the largely idiomatic word-setting and partly the concern for meaning that seems to be so rare on the operatic stage nowadays. Mind you, one would expect that with a cast of this quality. Owen Brannigan, with his experience in Britten’s bass roles, had a real character which comes over well even without the visual element; and Johanna Peters demonstrates that female voices can be every bit as good as male ones in getting the words over. Joseph Ward as Jack the Ripper sounds very tenorial (he was shortly to move decisively into the tenor range) and Alexander Young, with his experience in Gilbert and Sullivan, is every bit as good in creating a believable character out of the ninny of a young detective. The only weak link in the major roles is Marion Studholme as the young daughter of the household, whose white tones often sound undesirably pinched and all too often fail to expand in the high-soaring lines she is given to sing. Sir Charles Groves, the celebrated pioneer of so much British music in the 1960s and 1970s, engages fully with the score and gets fine performances from the BBC Northern forces even when the dry recorded sound makes the results sound very monophonic indeed. I remember similar results from a BBC broadcast of some years later when Holst’s The perfect fool was subjected to an intrusive narration of similar type. In the end the efforts of the performers to project character seem to be doomed by the rather matter-of-fact nature of the text and its all-too-faithful reflection in much of the music. The opera certainly does not rank above The Midsummer Marriage or Troilus and Cressida, let alone Peter Grimes; but it is of considerable interest as a piece of its period, and we should be grateful to Lyrita for rescuing Richard Itter’s tapes and making them available so handsomely. It adds enormously to the representation of Phyllis Tate’s music on disc, although we could also do with reissues of the recordings of her Apparitions and Three Gaelic songs available on LP at one time, the latter featuring no less an artist than Dame Margaret Price. At the risk of seeming ungracious, might we ask Lyrita to look at some of the BBC broadcasts of Alan Bush’s operas, barred from British stages at this time but which scored considerable success on stage in Germany? Four of these were the subject of BBC broadcasts during the period, and they demonstrate an engagement with the text which is largely lacking here. Wat Tyler would be especially welcome, if a tape exists - the composer himself owned one.